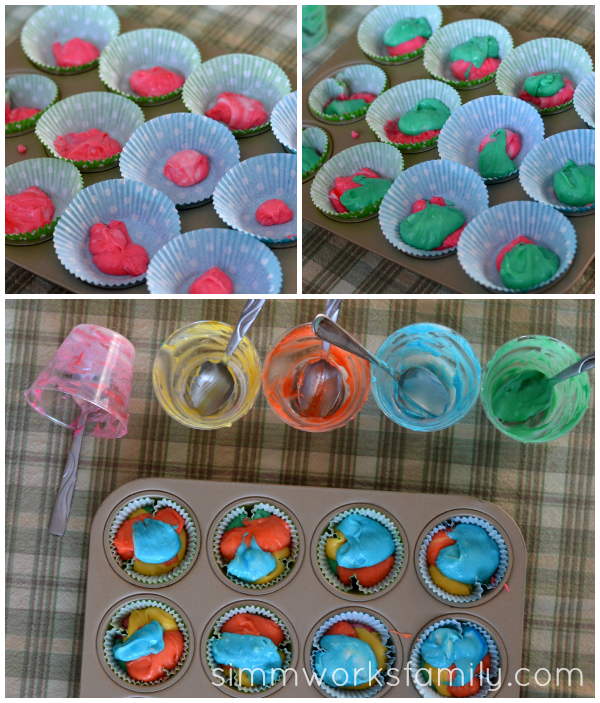 Rainbow Cupcakes - Perfect for St. Pattys Day! 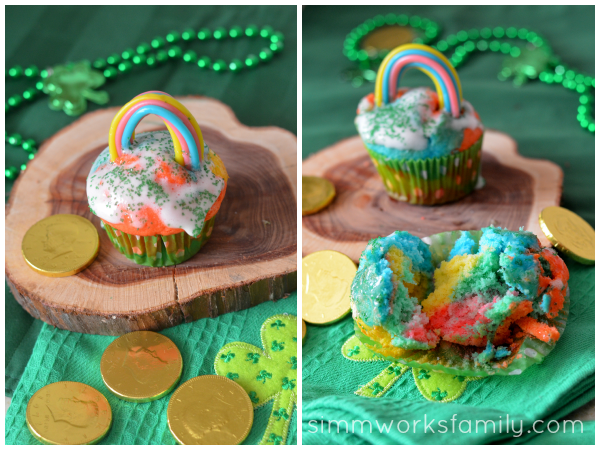 Rainbow Cupcakes – Perfect for St. Pattys Day! 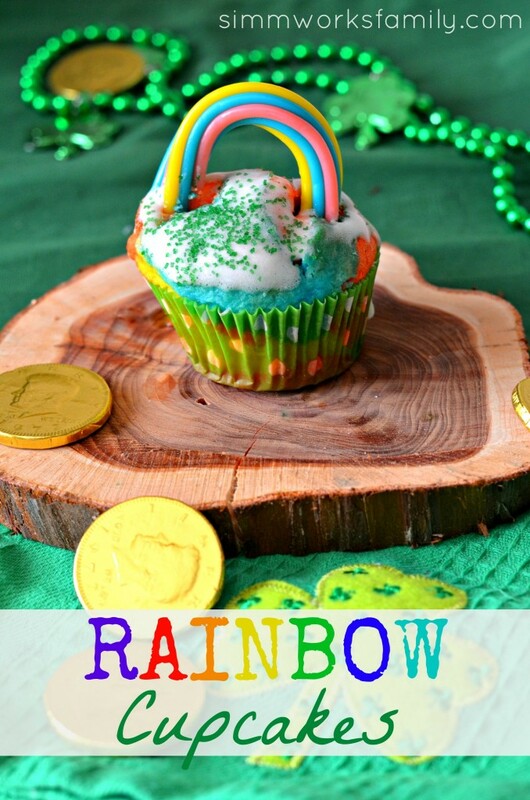 St. Patrick’s Day is getting closer and these rainbow cupcakes are the perfect way to celebrate! 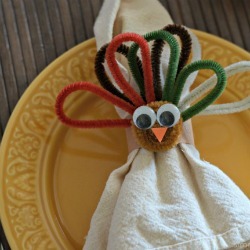 Not only are they super easy to make, they’re lots of fun too. And the rainbow is quite a favorite amongst the kiddies. Now these cupcakes can either be from scratch, like mine, or made from a box of white cake mix prepared just as the box tells you to. I used Dorie Greenspan’s Perfect Party Cake recipe. If you don’t have Baking From My Home To Yours then I highly suggest purchasing it. It’s amazing! 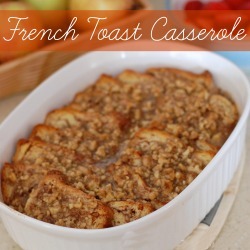 You can see how gorgeous this recipe is in cake form on my friend Ezra Pound Cake’s blog. I also made it for my son and daughter’s first birthdays. 2. Separate the batter into 5 cups or bowls. Add different colors to each bowl. For orange simply mix yellow and red together. For purple mix red and blue. 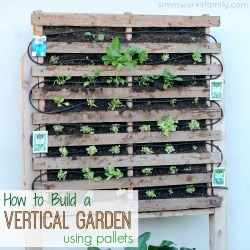 This is a great step for the kids to help with! 3. Mix up each colored cup of batter well so that there’s no white cake batter showing. 4. Spoon 1 tablespoon of first color batter into each cupcake liner. Spoon 1 tablespoon of the next color onto the first color. 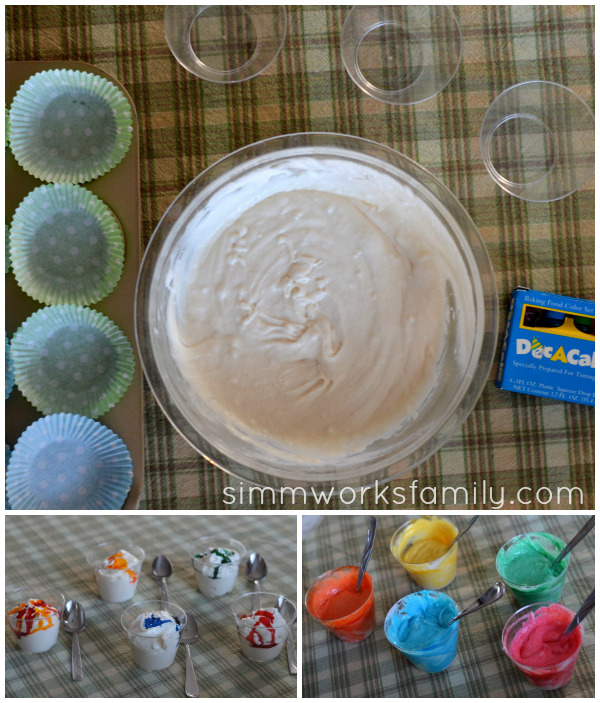 Repeat with the other colors until the cupcake liners are full and all of the batter is used. 5. Bake until a toothpick comes out clean (following the directions of your recipe). 6. 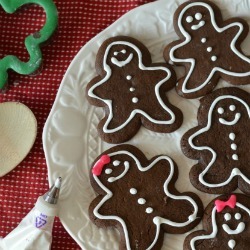 Frost with your favorite frosting (I used a marshmallow frosting I wouldn’t recommend… didn’t turn out how I thought at all!) and sprinkle with green sprinkles. 7. Using either Easter color twizzlers or rainbow sour belts from the candy store, add a candy rainbow to the top of your rainbow cupcakes. Tada! You’re done and have an awesome looking rainbow cupcake! Enjoy. Not crazy about artificial dyes? Here are a few ways to go more natural when using color in your batter! You can find more great ideas for natural food dyes on this awesome post here from Itsy Bitsy Foodies. Blue/Purple: Blueberry juice (blueish/purple), blackberry juice, grape juice concentrate – the grape juice worked the best for purple but gave a great color but a strong grape flavor. How cute! I bet your son and his friends loved them! I’d be ecstatic to get this if I were a kid! Cute! Thanks for the tips on natural dyes, too. I made some red velvet cupcakes for valentines with beets and they turned out great. These are so very cute!!! Great idea using natural stuff to dye food! These cupcakes are TOO cute! I’m off to pin this post to Pinterest. 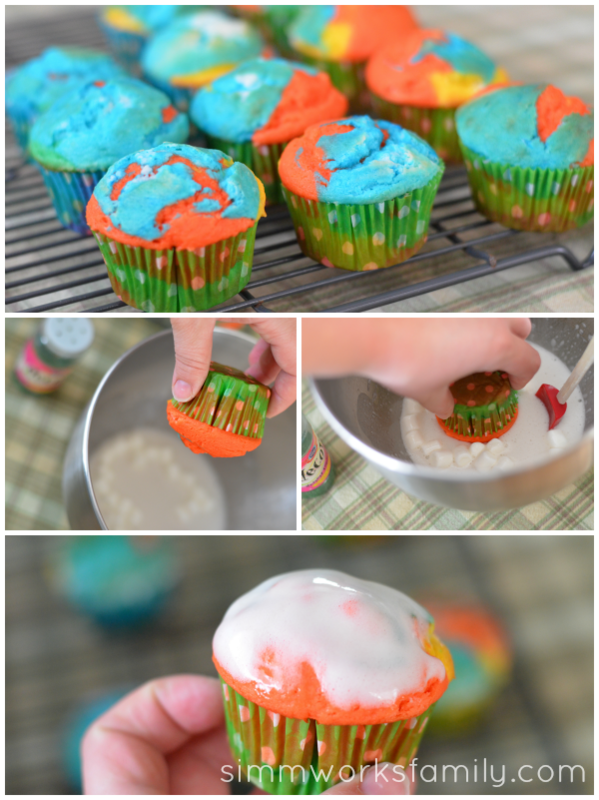 Love the colorful/messy/yummy looking cupcakes! The rainbow look is so great. How adorable! Those look so pretty! so fun! I love colorful stuff and while I will use the artificial stuff, the list of natural dyes is very helpful. 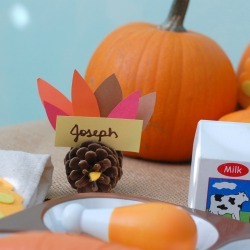 These are adorable and look like so much fun to make. My kids will love doing this. I love this especially since you’ve given natural dye alternatives. I HAVE to try this!! Those are so cute. I love all the colors!